Seven Rohingya Muslims refugees who were held at a detention centre in Assam since 2012 will be handed over to Myanmar. The Supreme Court of India has refused to stop their deportation. The new Chief Justice of India Ranjan Gagoi said, "We are not inclined to interfere on the decision taken". Rejecting the argument of lawyer of the Rohingyas that the government's move was against the UN charter, the Supreme Court accepted the Central Government's statement that the Rohingya were illegal immigrants and Myanmar had accepted them as citizens. The seven Rohingya refugees were bussed to the border on Wednesday to be deported. 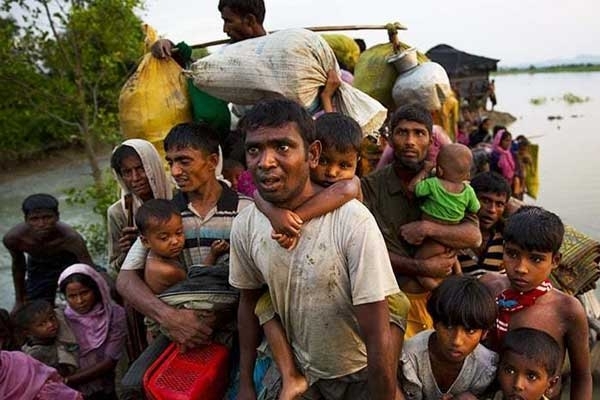 Bhaskar Jyoti Mahanta, additional director general of police in the northeastern state of Assam, told Reuters, “This is a routine procedure, we deport all illegal foreigners.” However, this will be the first time Rohingya immigrants would be sent back to Myanmar from India. It is wrong to say that these Rohingya have been recognised as citizens. A letter issued by the Deputy Commissioner of Police (Special Branch) on September 27, 2018 shows that the Special Branch of Delhi Police is clearly collaborating with Myanmar Government. It has accepted a separate nationality verification form issued by the Embassy of Myanmar and is coercing the Rohingya refugees to fill and sign this form. This form includes additional identifiers which were not included in the form circulated by Indian Home Ministry in October, 2017. Rohingya refugees have said that the form given by the embassy is the same as National Verification Card (NVC) which falsely frames Rohingyas as "foreigners or foreign-born or those with foreign roots”. It effectively frames Rohingyas as "foreigners or foreign-born or those with foreign roots”. It is not clear whether the Supreme Court has seen the form and satisfied itself about the status of citizenship that Myanmar has granted to the seven Rohingyas. This is being done when the UN refugee agency has clearly said that the conditions in Rakhine were not conducive for the safe, dignified and sustainable return of the Rohingya. Though India is not a signatory, it has a history of generosity towards persecuted people seeking safety within its borders. However, changes in people's attitude to Rohingyas first began in August 2017, when news emerged of guidance sent by the BJP-led Central government to all the 29 states, asking local officials to identify illegal immigrants for deportation -- including, Rohingya Muslims who had fled Myanmar. Kiren Rijiju, junior Home Minister told the Parliament on August 9, 2017, "The government has issued detailed instructions for deportation of illegal foreign nationals including Rohingyas." The words from one of Kiren Rijiju set off a wave of fear and uncertainty across Rohingya settlements in India. As Ali Johar, a Rohingya refugee who challenged the Home Ministry order told me, "We felt scared, we asked people about what we should do, who we should talk to? Where else can we go?" In an affidavit submitted to the Supreme Court on September 18, 2017 the government said that there exists "authentic material indicating linkages of some of the unauthorized Rohingya immigrants with Pakistan based terror organizations" and "that many of the Rohingyas figure in the suspected sinister designs of ISI/ISIS and other extremist group." Though the government said that it would submit evidence of this to the Supreme Court in a "sealed cover," to date, no evidence has been made publicly available that firmly links Rohingya refugees with international terrorist networks. The Indian government may not be a signatory to the specific UN Convention relating to the Status of Refugees, nor the Protocol Relating to the Status of Refugees, it is party to many other international conventions, like the Universal Declaration of Human Rights, which include the principle of "non-refoulement," which is the right to be protected from violence in their home country. It is clear that the Indian government is now going back on its long-stated policy towards refugees. In the case of Rohingyas, the BJP led government is playing domestic communal politics by trying to whip up communal sentiment, by labeling them as Muslims and potential terrorists. As the debate rages on publicly, Rohingya refugees continue to live in fear as they encounter more local hostility. It is appalling that at a time when the world community is moving towards prosecuting the Myanmar government for genocide, India, the world’s largest democracy, has become the first country to deport members of the world’s most persecuted community back to Myanmar, where they have been systematically, torture, raped, butchered and forcibly evicted. One cannot get away from the feeling that had the Rohingyas not been Muslims, they would have been allowed to stay on.